Visual Studio Code is powerful editor that Microsoft released at Build 2015. 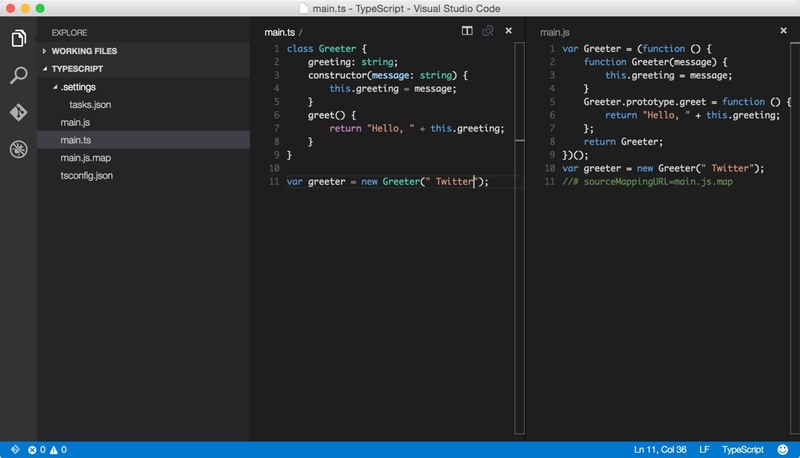 There have been several questions regarding how to setup TypeScript with Visual Studio Code on OSX. I decided that I’d stop for a second and make a quick post showing you exactly how to do it. Notice that it installed typescript 1.5.0-beta. This is required for Visual Studio Code. Create a New Project and create a new file called tsconfig.json. Note: By default the target is ES3. I changed mine to ES5, which Visual Studio Code supports, but it also supports ES6 (experimental). Note: Don’t worry about the windows section as the OSX installation of Visual Studio Code will ignore it. The only thing we changed here was the args field, which allows it to compile all files in the current directory and subdirectory and added isShellCommand to true. Notice that under the command parameter, it has tsc. If you didn’t install TypeScript first, then it would have failed here. Press CMD-Shift-B and you should see a main.js has been created. If you have any problems getting this to work, then check out my Github repo for this sample project. Thanks for reading and if you have any questions or comments, then leave them below.